Sleeping Dogs: The Awakening is Today’s free eBook download. 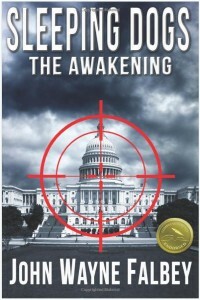 Written by John Wayne Falbey, the thriller follows a special operation team that is working to prevent the assassination of a presidential candidate. If you enjoy thrillers by such best-selling authors as Brad Thor, Lee Child, David Baldacci, and Alex Berenson, Sleeping Dogs is for you! The President of the United States has been targeted for assassination–by his own party’s power structure. A national election is pending and the killing must look as if the opposition party is responsible. Desperate to prevent the crime and avoid an overwhelming defeat, the opposition turns to the only force that can stop it this late in the game–a mysterious hunter-killer black ops team known only as the Sleeping Dogs. Sleeping Dogs: The Awakening is available as a free Kindle download from Amazon Friday, March 14, 2014 and Saturday, March 15, 2014. As of this writing, the book has 4.7 out of 5 stars from 27 Amazon reviewers. For more free eBooks, check out our 10 Websites to Download Free eBooks list, as well as our Free eBook of the Day archive.